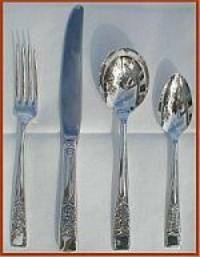 These are my most important tips on how to clean and care for vintage silver plate and sterling flatware. 1. Never ever use so called silver dips on your vintage flatware. Read here, courtesy The Antique Trader, what a renowned silver restoration expert says about tarnish removal dips and related products. It may remove the oxidation (tarnish) but also the lovely patina on old silver leaving it dull and stripped. Some dips also leave unsightly spots that are impossible to polish out. When dip solutions come in contact with stainless steel knife blades they become spotted, blemished. They are not removable by polishing or other treatments. Not to mention that many such chemicals may be dangerous to your health. 2. I recommend Hagerty Silver Foam to remove heavy oxidation. Hagerty products are available in better department store house wares areas and at some hardware stores. 3. For fine polishing I use Simichrome Polish. It’s a cream with a minimum of abrasive. It is sold on the Internet and also at motorcycle dealerships such as Harley-Davidson. Motorcyclists love it to keep the chrome on their cycles shiny. Wash the silver before using, see 5. and 6., below. 4. For intermittent care of already polished items, a socalled Blitz cloth is wonderful. Just rub gently to remove any new oxidation. Blitz products are sold on the Net and can also be found in better department store house wares areas and in larger jewelry stores. This product is almost a hundred years old and still trusted by the experts. 5. Always wash your vintage silver flatware in warm water with a mild detergent. Never put it in a dishwasher. It’s much too invasive for silver as the detergent chemicals and dryer heat can damage it, see results here. Also, never leave it to soak in detergent solution for hours or overnight after use. Always wash it as soon as possible after use, rinse well, dry thoroughly and store till the next time. Use a soft sponge, never a stiff brush that can scratch the finish. 6. All silver flatware should be washed, rinsed and dried before and after each use. This will help prevent it from oxidizing and ensure that there are no bacteria or silver polish residue left on the utensils. You can keep your knife blades shining and free of stain or pits simply by washing and drying them immediately after use. Stainless steel got its name because it stains or corrodes far less than ordinary steel. But pits will form on all stainless steel if the metal remains in contact with salt for many hours. Even worse is leaving knives in water for an unreasonable length of time … especially if the stainless steel is touching silver. Once a pit is formed, it can corrode still more. Remember … always wash and dry your knives immediately after they’ve been used. Don’t rinse and stack. 8. Final Important Tip: Never store your vintage silver wrapped in linen or flax cloth or resting on top of it in a drawer. These fabrics emit gases even after many washes, which gases speed up oxidation on silver. Also, do not store silver in antique oak furniture. Oak also emits certain gases that have the same effect: Silver oxidizes faster. Newer oak furniture is sealed to prevent this but antique oak is usually not. Best way to store silver is in anti-tarnish cloths available where fine silver is sold or in a proper silver chest. Disclaimer: I have no interest in endorsing the above products other than that I have used them personally for years and trust them.